As the Vikings' starters prepare for their final dress rehearsal, it’s time to start thinking about how the roster could be structured. Daniel House projects the roster cuts. Updated: August 24, 2017, 5:15 p.m.
As the Vikings' starters prepare for their final dress rehearsal, it’s time to start thinking about how the roster could be structured. After evaluating players in training camp and the preseason, it is easier to see players separating themselves in the race for a roster spot. My Take: Many people believe the Vikings may only keep two quarterbacks, but under the leadership of GM Rick Spielman, the team has repeatedly had three on their roster. Mike Zimmer even echoed the preference to keep three quarterbacks in a recent interview. Taylor Heinicke hasn’t necessarily performed well in the preseason, but put together a bounce back performance against Seattle. It appears he may be adjusting to playing in games again after missing all of last season. Heinicke has been battling an injury, which could complicate the roster decision at this position. Case Keenum has put together a positive preseason, moving the offense down the field with rhythm. He has been making the necessary throws in the system and has responded better in live action than practices. He has distanced himself in the race for the backup quarterback job. My Take: The Vikings have a trio of running backs that all provide different benefits on offense. Dalvin Cook is dynamic, Latavius Murray is a power back, and Jerick McKinnon can be a change of pace. Cook will likely be the starter and has shown the potential he can bring to this offense. His elusiveness and vision make him very difficult for defenders to bring down. Sunday night will be our first look at Latavius Murray, who should be a nice complement to Cook. Jerick McKinnon may be used in the receiving game this year as a matchup threat, as well. 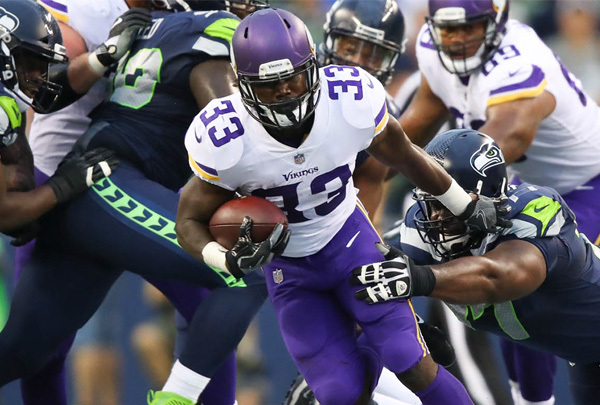 My Take: I always waver back and forth when I project whether the Vikings will keep a fullback. It really is dependent upon whether the Vikings keep four tight ends. Ham was tested frequently in the preseason and showed progress throughout camp. With Ham, the Vikings not only have a fullback, but a versatile running back in a pinch. Ham’s fundamentals as a run blocker and pass protector have been evolving and he can be a serviceable fullback in this system. My Take: Outside of the top-two, there is less certainty at the wide receiver position. Laquon Treadwell has missed significant time, but should be back for the preseason game Sunday night. Treadwell was showing growth early in camp and will have the opportunity to emerge as the third wide receiver while Michael Floyd serves his suspension. Jarius Wright is one of the most reliable receivers the Vikings have on their roster. He mysteriously disappeared last season, but should play a more integral role in a wide receiver room that needs veteran leadership in the backend of the depth chart. Finally, the decision gets tough for the fifth wide receiver spot. Stacy Coley has shown more upside as a wide receiver, while Rodney Adams needs more polishing as both a pass catcher and returner. The Vikings might elect to place Adams on the practice squad if they keep just five wide receivers. In the event this scenario plays out, Marcus Sherels would handle all of the return duties. My Take: There is no way the Vikings could slide Bucky Hodges onto the practice squad without him being snatched up. With that being said, the team might elect to keep three tight ends and a fullback. They could place tight end Kyle Carter on the practice squad to have a versatile option available in case of injury. David Morgan has been a huge asset as a run blocker and can provide reliable hands as a pass catcher, too. Bucky Hodges is still adjusting to playing more as an inline tight end, but his upside is very high. My Take: The Vikings’ offensive line took a nice step forward in the second preseason game. Sunday night will be the first opportunity to see the starting five work together. However, Rashod Hill and Nick Easton have benefited from additional reps. Their progress makes everyone feel better about the depth up front. In addition, Danny Isidora has shown his developmental potential for the future. He could also step into an interior guard spot if an injury occurred. At the final tackle spot, Willie Beavers has shown vast improvement in pass protection and his overall technique. At this point, Jeremiah Sirles has struggled at the tackle spot and shouldn’t make this team if he isn’t going to play guard. Beavers has shown enough growth for me to feel confident about him holding the final spot on the offensive line. My Take: This is the area where difficult cuts will be made. The defensive line has the deepest amount of talent on the roster. At the defensive end spot, the final one or two spots will be a battle. Tashawn Bower has made a strong case to crack the 53-man roster. To open the preseason, he has tallied numerous quarterback hurries and two sacks. His pass rushing angles are evolving and he is mastering all of the technique under Andre Patterson’s instruction. If the Vikings elect to keep four defensive ends, Bower should edge Stephen Weatherly. However, keeping five players at this position seems the most realistic. I’m a huge fan of Ifeadi Odenigbo’s potential. He could become a very successful player in this league with more development. He plays with fantastic power and upper body strength. Odenigbo has been developing more pass rushing moves, which has benefited him. However, at this point, Stephen Weatherly has been improving and is a valuable player across the special teams units. Odenigbo can likely be stashed on the practice squad. The team also could look to trade a player to open up a roster spot for a young player. My Take: Will the Vikings value youth over veterans at defensive tackle? They could, but Tom Johnson’s leadership and ability in subpackages is worth keeping around. Free agent signing Datone Jones is noticeably adjusting to playing inside and it might result in him being cut to keep a young player like Will Sutton. Sutton has upside in the system and can provide necessary depth inside. It is possible the Vikings will choose between Jones or Johnson when roster cuts roll around. Shamar Stephen can rotate into the defensive line and be a backup at the nose tackle spot. After a strong preseason, Jaleel Johnson may challenge for first-team reps at the three-technique defensive tackle spot. He has been dominant and gives the Vikings a versatile option at a key position in the defense. For more on why Johnson should see starting snaps, check out this piece. My Take: I could see Ben Gedeon being the starting weakside linebacker when the Vikings open the season on Sept. 11. Gedeon may have more deficiencies in coverage, but will get better with experience. His skills as a run defender provide the Vikings with a physical presence in their base defense. Emmanuel Lamur hasn’t done enough to separate himself for the starting gig and will likely find himself on the outside looking in. Edmond Robinson has struggled in the preseason, but still has developmental upside and special teams experience that are worth keeping around. Kentrell Brothers has missed extensive time with a hamstring injury, but was one of the best special teams contributors last season. His contributions on the coverage units are vital for this team. In addition, linebacker Eric Wilson has shown his ability to fly around the field and make plays. He is extremely instinctive and can be another solid special teams player and depth option. Wilson will likely edge rookie Elijah Lee, who is more of a practice squad candidate. My Take: The cornerback spot really provides no big surprises. The top four players will need to step up, especially Mackensie Alexander in the nickel cornerback role. In addition, Trae Waynes will need to shoulder the responsibilities opposite Xavier Rhodes. Marcus Sherels can handle all of the return duties. The Vikings’ secondary will be an integral component to their success. With that being said, they may need to sign or trade for one more defensive back to have enough depth. The team can slide Terrell Sinkfield on the practice squad to continue growing under the instruction of defensive backs coach Jerry Gray. Outside of offensive line play, the cornerback spot will be a major key for the 2017 Vikings. S (5): Harrison Smith, Andrew Sendejo, Jayron Kearse, Anthony Harris, Antone Exum Jr.
My Take: There aren’t really any shocking developments with this position. Jayron Kearse will continue developing with more instruction and has been a force when he’s been placed in the box. Now, he needs to continue learning the footwork and fundamentals when he covers the deep half of the field. Anthony Harris continues to progress and plays with above average awareness in the backend. He can easily be the first player off the bench if an injury occurs at safety. If the Vikings decide not to add an additional defensive back, Antone Exum Jr. will make the team. I thought Exum Jr. played well against Seattle and has the flexibility to slide into the nickel cornerback spot. He put together a strong training camp and has managed to stay healthy so far. My Take: Awhile back, Mike Zimmer indicated Ryan Quigley may be ahead in the punter competition, but I’m not convinced yet. Taylor Symmank has a big leg and puts well directionally. The issue for him has been consistency. Quigley has punted with better hangtime into the coffin corners, but Symmank has shown an ability to shift the field. The race will continue over the next two games for the starting gig. At kicker, Kai Forbath has been very accurate and drilled a beautiful 51-yard field goal in the last preseason game. Marshall Koehn might have more distance on his kicks, but he’s been less consistent in both games and practices. Forbath provides more stability at the position. Daniel your article is really long and detailed.If you're ever having trouble look up for custom essay writing service. you'll find online services to help you with your work. Good luck mate!